Ukrainian Prime Minister Volodymyr Groysman has said that the agreement with the European Investment Bank (EIB) signed during his visit to Brussels (Belgium) would allow financing the project on sustainable power supply to residents of four regions of Ukraine. "I have met President of the European Council Donald Tusk and President of the European Commission Jean-Claude Juncker, as well as Vice President of the European Commission [Valdis] Dombrovskis and we discussed the issues of our further economic cooperation and macro-financial support. I am very pleased with these negotiations. They were concrete," he said on Priamy TV from Brussels late on Thursday. In particular, according to him, agreements have been signed that provide for funding projects for the sustainable provision of electricity to residents of four regions of Ukraine by the EIB. "And we signed a memorandum on [the provision of] EUR 75 million to five cities to ensure the necessary level of safety on the roads in these cities, including Dnipro, Kharkiv, Odesa, Lviv – the cities that will use these resources to have safe roads," the prime minister said. 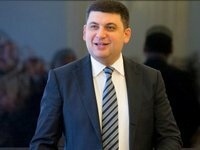 As reported, the press service of the Cabinet of Ministers reported that Ukraine and the EIB have signed a number of international agreements within the framework of the working visit of Groysman to Brussels. Among the agreements signed by the EIB are the financial agreement with NJSC Ukrenergo and the guarantee agreement under the project "Substation Reliability Enhancement Program," which is designed to increase the efficiency and reliability of the domestic power system for its integration into the network of European transmission system operators. In particular, the matter concerns replacing the equipment of high-voltage substations with a simultaneous transition to modern schemes of switchgears and installing automated process control systems at the substations of the southeastern region of Ukraine. It is also planned to reconstruct 11 substations of 330 kV and one substation of 750 kV of Dniprovska power system.